Two Mormon Missionaries pray over Latter-day Saint scripture in their shared room. In short, it’s a weak argument because it is subjective and inconclusive. It doesn’t give any actual reasons for why Mormonism is false and orthodox Christianity is true. It’s a bad argument against Mormonism because it’s a bad argument, period – which makes it a bad argument even when the Mormon uses it. 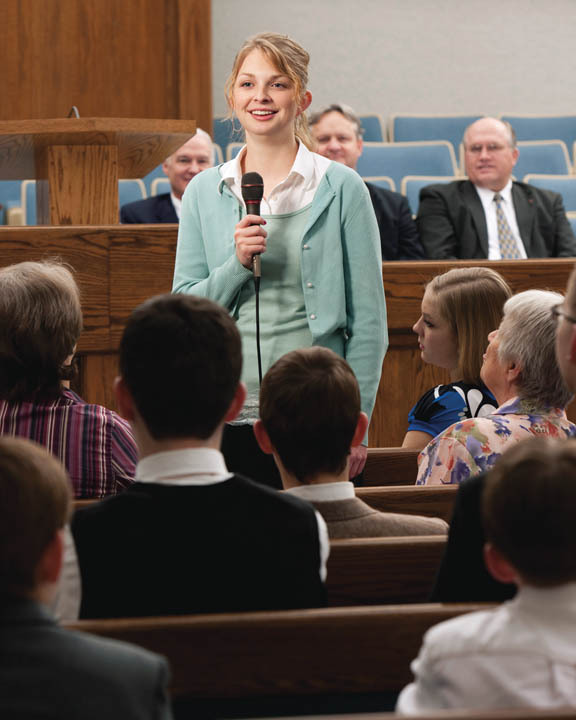 Testimonies are not inherently bad things. Testimonies are used in a court of law as evidence. But testimonies are given regarding a certain event that somebody witnessed. You can’t rely on your own subjective experiences to convince somebody else of the truth of your beliefs. The major problem is that in the Mormon’s testimony, they don’t give us any reason to believe Mormonism is true. A subjective experience may give you a reason to believe but it doesn’t give anyone else a reason to accept your beliefs as true. Arguing that it is the correct church doesn’t help. I need to know why it is the correct church. A related point, that this testimony doesn’t give us any reason to believe in the truth value of Mormonism. Eyewitness testimony was important for the Disciples because they actually witnessed Christ’s resurrection. A Mormon testifying to you that Joseph Smith is a true prophet, or you testifying to the Mormon that he was a false prophet, is not very compelling since neither one of you were there, nor did either of you know Joseph Smith, personally. This means that your testimony regarding Joseph Smith is inadmissible. We have reasons to believe that Joseph Smith was a false prophet, but a testimony regarding Joseph Smith is not one of them. Finally, this testimony can be turned right back around on the Mormon (or on you). You can just reply with, “I know that the Church of Jesus Christ of Latter-Day Saints is a false church. I know that Joseph Smith was a false prophet,” etc. Then you’re left with the dilemma of whose testimony is correct, or even which is the more powerful testimony? This can be rhetorically effective, but it offers no grounding for the claim that your respective beliefs are true. There are certain testimonial arguments that can raise the truth claims of Christianity. For example, the Disciples’ eyewitness testimony to the risen Christ, or a modern person’s witnessing of a legitimate miracle. Instead, we should be focusing on the reasons for our faith, not the fact that we have it. We do not have to pray to test truth claims. We have the Scriptures given to us so that if we come across a particular idea, we can test it against Scripture to see if it holds up (1 Thessalonians 5:21). All over Scripture we are told to use our faculties of reason. If Mormonism is false, it stands or falls on its teachings, not on whether or not I believe it to be true. And more generally, Christianity, itself, is a religion that is based on evidence, not “blind faith,” as atheists tend to allege. We are told to “love the Lord your God with…all your mind” (Matthew 22:37, NASB). God told the Israelites “Come, let us reason together” (Isaiah 1:18, ESV, emphasis mine). And as C.S. Lewis, in his book Mere Christianity, has observed, “God is no fonder of intellectual slackers than he is of any other slackers.” The Christian life is one marked by reason and reflection. It is not based on feelings or emotion, which are not accurate guides for determining truth. We read in Scripture that “the heart is more deceitful than all else and is desperately sick. Who can understand it?” (Jeremiah 17:9, NASB). If you believe the Mormon church to be false, you need to point out which doctrines are false and explain why they are false. If you believe Joseph Smith to be a false prophet, point out reasons why you believe so. Show some prophecies which have failed to take place (the Bible in Deuteronomy 18:22 says that if even one prediction fails, that person is not a prophet of the Lord). The bottom line is, if you want to be able to convince a Mormon of the truth of orthodox Christianity, you need to give arguments for it. All things taken into consideration, we are never exhorted in Scripture to “ask God” whether or not a various belief is true. God has given us minds to reason. If we encounter any view or belief, we don’t have to ask God whether or not it is true. We can compare it to Scripture to test whether or not it is true. Whether coming from the lips of a Mormon missionary or an orthodox Christian, this argument just doesn’t do the work of supporting any truth claim that we make. I have personally heard this testimony when I spent a few months in conversations with two Mormon missionaries. I found a transcript of the archetypical Mormon testimony at the Mormon411 website in the article entitled, “An Actual Mormon Testimony”. C.S. Lewis, “Mere Christianity (C.S. Lewis Signature Classics)”, (p. 78, Kindle position 1071). HarperCollins. Kindle Edition. The only time I can see this weak argument as being effective is when you are using it to make exactly the point that a testimony is inconclusive and subjective, and to then from there lead into the evidence. Exquisite writing as always, Fred. Thank you for the compliment Dave but the credit for this masterpiece goes to Clinton Wilcox. I was merely the humble editor on this one – and I do mean humble because Clinton is so good that I fixed one typo and then put it to bed! Yes folks, he’s THAT good!